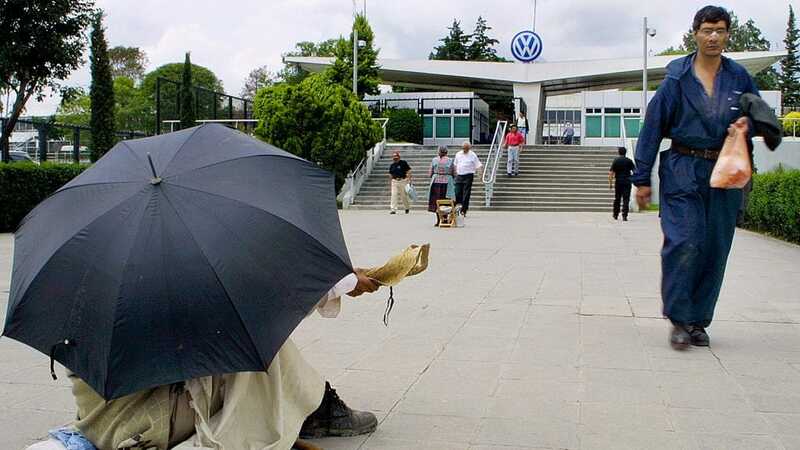 Farming communities are blaming Volkswagen for the loss of their crops after the company’s use of “hail cannon” weather-modification devices at a plant in the Central Mexican state of Puebla allegedly deprived Mexico’s historic breadbasket of rainfall throughout much of the year. At the start of this past May, when the rainy season began, the automaker introduced the cone-shaped cannon devices and began firing them off with alarming regularity, sending chemical and sonic shockwaves toward clouds every six seconds in an attempt to disperse storm clouds and prevent the formation of hail as large as tennis balls that could potentially pummel thousands of newly-produced cars parked outdoors. Farmers in the affected towns and cities surrounding the factory are demanding nearly USD $3.7 million (70 million pesos) compensation for the loss of around 5,000 acres of corn, bean and cereal crops–a catastrophic loss for the over 100,000 rural people who rely on the harvest for their livelihood. Volkswagen has defended its use of the weather-modifying cannons while pledging to drastically cut back their use by toggling a “manual” rather than “automatic” setting for the devices. The company has also pledged to install anti-hail nets over new car lots at the plant, which employs around 15,000 people and produces nearly half a million vehicles per year. On the one hand there are the immediate losses of the crops [and] on the other hand, there is the ecological damage caused by the disruption of the natural water cycle. Rather than reducing these large hailstones to snow or water, they’ve interrupted the normal rain cycle, affected the ecosystem, drained our rivers, and seriously impacted the water table – the source of freshwater that human life depends on. This is a practice that stems from the exploitative, expansionist methods of global capitalism, entrenching itself and gambling on the damage it causes to society, in a bid to accumulate profit. Given the imperialist nature of the global economy, Foster explained to MintPress News, the needs of poor, disempowered, and exploited populations like the indigenous campesinos of Puebla are usually the first to be sacrificed by the corporations and wealthy states that constitute the center of the world capitalist system. Populations in the global South are experiencing the detrimental effects of climate change, such as drought, more than those in the global North, and have fewer resources to cope with it. Peasant populations are relatively easily imposed upon in such circumstances by the capitalist economic machine. In the face of climate change, there are all sorts of ways in which attempts are being made to ensure capital accumulation and to protect the interests of the wealthy and various imperial interests. Hail cannons–crackpot science or an effective solution? By the early 20th century, around 60 different types of hail cannon were in commercial production, regardless of the fact that the method was scientifically unproven. There was a proliferation of hail cannon production in Europe from 1895-1905, after which it was deemed ineffective, and the hail cannon makers converted to making cannon in the arms race that preceded the First World War. This, however, was the biggest attempt at weather modification prior to the 1950s. Meanwhile, hail insurance was introduced. Today, hail insurance costs are skyrocketing due to climate change, and so more and more economic interests are seeking technological means, such as the latest hail cannons and anti-hail nets, as a response. The modern hail cannons, billed as “anti-hail sonic devices,” were installed in Volkswagen’s Cuautlancingo plant after VW’s car lots in Chattanooga, Tennessee, and Wolfsburg, Germany, experienced major hail storms that caused tens of millions of dollars in damage. 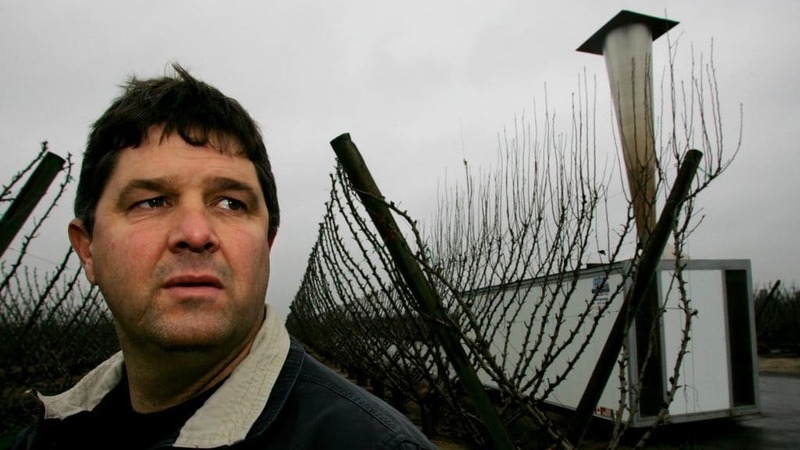 Volkswagen is far from alone in adopting the cannons: farmers in California’s Central Valley, apple orchard owners in Michigan, and vineyards across Europe have deployed such devices to protect their crops. Japanese auto manufacturer Nissan has also used sonic cannons in Mississippi, angering local residents. There’s no evidence that they actually do anything…It may be possible. But if they really do something, they’re doing it through some unknown science that we don’t know about. In regions where this illegal and criminal method of the hail cannons has been used–including in Jalisco, Chihuahua, Colima, Chihuahua, and of course Puebla–the people are convinced that this technique doesn’t help to protect crops and instead damages them and the ecological system as a whole. The problem faced by Mexico’s farmers isn’t simply a local problem, but a sign of a growing global trend with permanent ramifications on a global ecological scale, Foster argued. Weather-engineering is local and regional but it inevitably has larger, unintended effects, since the atmosphere has no walls…Widespread weather modification could conceivably generate large-regional and even planetary-level effects with all sorts of indeterminate consequences. Without a doubt, attempts by wealthy forces to mitigate the effects of climate change caused by the fuel economy are only growing. Earlier this year, the South China Morning Post reported that Beijing’s state-owned China Aerospace Science and Technology Corporation has been building a network of tens of thousands of fuel-burning, cloud-seeding chambers across 62,000 miles of the Tibetan Plateau in a bid to bring more rain and freshwater to reservoirs. The U.S. and other countries have attempted similar projects in the past, but the Chinese effort is, by far, the largest such weather engineering project in human history. More than fifty nations worldwide are seeking to modify the weather at present, including dispersing fog, enhancing rain and snow, and suppressing hail. The United Arab Emirates carried out 177 cloud seeding operations in 2016. Israel has a long history of weather modification. He added that such operations are dominated by economic and military interests. Indeed, in 1974 The New York Times reported that the Pentagon, under the direction of then-White House National Security Adviser Henry Kissinger, used cloud-seeding technology in an attempt to impede the movement of Vietnamese national liberation fighters by inundating them with rain. The effects of climate change and the adaptation of multinational corporations to the new conditions are having deleterious effects of one kind or another on populations everywhere. An example of what is to come is to be found in the recent decision of Wendy’s to source all of its purchases of tomatoes from indoor farms. In response to a cold winter in Florida in 2010 that disrupted its supply chain, Wendy’s shifted to hydroponic and greenhouse tomatoes. It intends to buy all of its tomatoes from now on only from indoor farms. It is clear that this decision is affected by climate change. It is also evident that such decisions by corporations acting on their own, magnified many times, could have huge effects on farming, farmers, and even the future of the climate—as what is now needed to mitigate climate change is not indoor farms but the expansion of agroecology across the earth. We congratulate the struggle of the indigenous peoples against Volkswagen’s aggression toward human life, and we also celebrate the social organizations that have accompanied the farmers, as well as those scientists and academics who have laid out their knowledge of the issue. Yet he’s also quick to point out that no legal framework exists on the federal or state level that would ensure the protection of Mexican agriculture from the multinational industries that operate across the country. Toward that end, social movements are also demanding that the state congress organize an urgent forum that would see indigenous representatives, campesino groups and business associations work to resolve the issue. Lozano is both an independent Zapatista organizer with MAIZ and a member of the militant base of the National Regeneration Movement (MORENA), the social-democratic party whose presidential candidate Andres Manuel Lopez Obrador (AMLO) won a landslide victory in June. MORENA lawmakers on the federal and state level have to intervene immediately and open the ears of authorities from PRI, PAN and PRD, who have allowed these attacks on the people’s ecological and social welfare. Given the poverty and unrest Mexico has been awash in over recent decades, MORENA would do well–if only for the sake of self-preservation–to work alongside its militant mass base rather than to pursue a road of accommodation with the multinationals who run rampant across the country. But only time will tell what road they pursue. The task of combating ecological devastation naturally converges with the task of fighting for social-system change, Foster explained, and this is an inevitable product of the combined pressures of ecological degradation and economic hardship–a product that produces what he calls an “environmental proletariat” among workers and an “ecological peasantry” in the countryside. The reason is that people respond to the material conditions that affect their lives and their production. In this respect, the separation that existed for some time between economic and environmental conditions is breaking down. In the present period of crisis it is often difficult to distinguish the economic and environmental causes of the catastrophes that are affecting people’s lives. This is creating the basis of wider, more holistic, co-revolutionary struggles, in which both economic and environmental interests of workers and peasants (that is, their material interests as a whole) are the issue. Throughout Mexico’s modern history it has largely been the rural population—the peasants, agrarian workers, and indigenous communities—that has served as the motor force of social progress. Their fight for social rights reached a crescendo during the Mexican Revolution of 1910-1920–an epochal event whose goals were quickly betrayed by the country’s propertied ruling elites. It is in those historical periods where workers have been involved in a combined struggle over their working conditions and their environmental conditions that they have been most revolutionary. …If we let the private sector (or states controlled by capital) make our decisions for us, then the consequences for populations and the environment—viewed by the capitalist system as mere ‘externalities’—are bound to accumulate, to the detriment of people and the earth.